As we age, our sensory modalities (including vison) show gradual deterioration. Older people must adapt to problems such as reduced visual field, decrease in visual acuity, delayed dark adaptation, reduced colour perception and decreased power of accommodation resulting in presbyopia. Taken together, these different visual problems all lead to impairment of visual function. Then in addition, a large number of older people also suffer from medical conditions affecting function of the eye, such as glaucoma, age related macular degeneration, diabetic retinopathy and cataracts. As mentioned above as you age different sensory systems may become impaired, be it through diabetes and peripheral proprioception or vestibular systems through benign paroxysmal positional vertigo. As other systems are affected extra reliance can be place upon vision for a person to gain critical imformation from their surrondings in order to remain steady. It is important, therefore, that there is an extra-importance in aintaining visul acuity through regular eye appointments, in fact the NHS provides free annual eye tests to those above the age of 75. Such is the importance of eye sight and falls risk it is now part of the NICE falls guidelines. With aging there is a decrease in peripheral and upper visual fields. It is thought likely that in the early stages this may be as a result of decreased pupil size and therefore less light admitted to the peripheral retina; later on changes may result from decreased retinal metabolism. In addition loss of retrobulbar fat results in the eyes sinking more deeply into the orbits which leads to a mechanical restriction of upper gaze. Visual acuity is the ability of the eye to discriminate fine details of objects, and it frequently (not inevitably) declines with age. An increase in the thickness of the lens combined with its loss of elasticity result in decreased ability to see clearly, and particularly affect near objects. In addition, with increased age the iris no longer changes width and pupil size remains small in both dim and bright light, resulting in detrioration in night vision. It is generally thought that other contributing factors are loss of photoreceptors within the retina and possibly changes in the geniculostriate pathway. Accommodation = the ablity of the eye to focus images on the retina independent of object distances. With age both the cornea and the lens lose transparency, the lens thickens and becomes more rigid and the ciliary muscle weakens. All of which cause the lens to gradually lose its ability to change shape and focus at varyig distances. This is generally labelled presbyiopia, which means "old eye". With increased age, changes in the retinal cones and the visual pathways, as well as in the lens, lead to the eye becoming less sensitive to colours that have shorter wavelngths, ie. blues, greens and violets (the cooler colours). In addition, pale pastel colours may become more difficult to distinguish, as may varying shades of grey. The ability of the eye to become more visually sensitive after remaining in darkness for a period of time is delayed in older people. Metabolic changes in the retina result in reduced oxygen supply to the rod-dense area of the retina and the reduction in pupil size both contribute to this problem. Age-related macular degeneration (AMD) is a common, polygenic disease in which multiple genetic variants as well as environmental, lifestyle factors contribute to disease risk, each adding a small to moderate amount of increased risk. The risk of developing the disease is three-fold higher in people who have a family member with AMD than in those without a first-degree relative with AMD. Glaucoma is currently defined as a disturbance of the structural or functional integrity of the optic nerve that causes characteristic atrophic changes in the optic nerve, which may also lead to specific visual field defects over time. This disturbance usually can be arrested or diminished by adequate lowering of intraocular pressure (IOP). 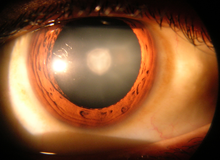 Glaucoma is the second leading cause of blindness in the world (surpassed only by cataract, see below, which is a reversible condition). In glaucoma the loss of vision often occurs gradually over a long period of time, and symptoms only occur when the disease is quite advanced. Once lost, vision cannot normally be recovered, so treatment is aimed at preventing further loss. Treatment can involve medications to lower intra-ocular pressure (IOP), laser or conventional surgery. Senile cataract is a vision-impairing disease characterized by gradual, progressive thickening of the lens. It is one of the leading causes of blindness in the world today, and is treatable by surgery. Senile cataract continues to be the main cause of visual impairment and blindness in the world. In recent studies done in China, India, Canada, Japan, and Denmark, cataract was identified as the leading cause of visual impairment and blindness, with statistics ranging from 33.3% (Denmark) to as high as 82.6% (India). Published data estimate that 1.2% of the entire population of Africa is blind, with cataract causing 36% of this blindness. In a survey conducted in 3 districts in the Punjab plains, the overall rates of occurrence of senile cataract was 15.3% among 1269 persons examined who were aged 30 years and older and 4.3% for all ages. This increased markedly to 67% for ages 70 years and older. Photograph by Rakesh Ahuja, MD, from Wikipedia. Senile cataracts have been associated with a lot of systemic illnesses, to include the following: cholelithiasis, allergy, pneumonia, coronary disease and heart insufficiency, hypotension, hypertension, mental retardation, and diabetes. Systemic hypertension was found to significantly increase the risk for posterior subcapsular cataracts. Evaluation of Different IOL Calculation Formulas of the ASCRS Calculator in Eyes After Corneal Refractive Laser Surgery for Myopia With Multifocal IOL Implantation. Rotational Stability and Centration of a New Toric Lens Design Platform Using Objective Image Analysis Over 6 Months. Refraction and Change in Refraction Over a 20-Year Period in the Beaver Dam Eye Study. A Metabolomics Profiling of Glaucoma Points to Mitochondrial Dysfunction, Senescence, and Polyamines Deficiency. Lens Dose Reduction by Patient Posture Modification During Neck CT.
↑ Bathija R, Gupta N, Zangwill L, Weinreb RN. Changing definition of glaucoma. J Glaucoma. Jun 1998;7(3):165-9. ↑ Kingman, Sharon (2004). "Glaucoma is second leading cause of blindness globally". Bulletin of the World Health Organization 82 (11): 887–8. ↑ Murthy GV, Vashist P, John N, Pokharel G, Ellwein LB. Prevelence and causes of visual impairment and blindness in older adults in an area of India with a high cataract surgical rate. Ophthalmic Epidemiol. Aug 2010;17(4):185-95. ↑ Maberley DA, Hollands H. The prevalence of low vision and blindness in Canada. Eye(Lond). 2006/03;20(3):341-6.